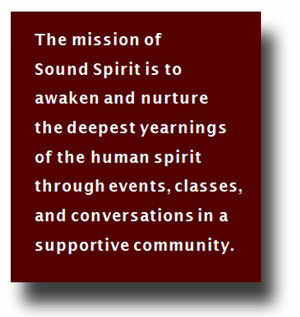 Sound Spirit | We awaken and nurture the deepest yearnings of the human spirit through events, classes, and conversations in a supportive community. The Sound Spirit initiative seeks to support individual exploration of spirituality and what it means. Sound Spirit is located at the Suquamish UCC, in the town of Suquamish in the north Kitsap Peninsula of Puget Sound.